Parking: Public parking is possible at a location nearby. 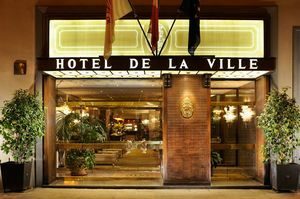 The elegant Hotel de la Ville enjoys an ideal location in Florence’s historic city centre. Its noble furnishing gives guests a taste of the iconic Florentine style. Touches of colour create a welcoming and cosy atmosphere. You will be charmed by the hotel’s lovely facilities as well as its refined and comfortable rooms. 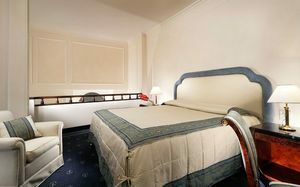 Perfectly located at the heart of Florence city centre, the hotel is situated in the famous Via Tornabuoni, a pedestrian street where the most famous shopping brands can be found. Piazza del Duomo as well as the Basilica di Santa Novella are roughly five minutes from the hotel, and the world famous Ponte Vecchio can be reached in less than ten minutes. The hotel de la Ville has a charming breakfast room where a delicious breakfast buffet is served every morning. Guests will have the opportunity to taste local specialities as well as fresh fruits, juices, yoghurt, salami, eggs and cheeses. The cosy lounge bar is perfect to relax and enjoy an afternoon tea or an aperitivo after a long day of wine tasting. The hotel also has a meeting room where workshops and conferences can be organised. 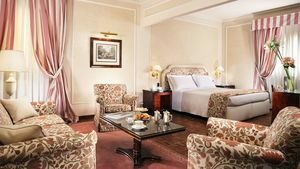 The 68 rooms offer all the modern comforts in an elaborate and elegant Florentine style. All the rooms have en-suite bathrooms, climate control, Satellite TVs, complimentary WIFI, safes and minibars. Room grades include Classi and Superior as well as several different Suites. Suites also include bathrobes and slippers.